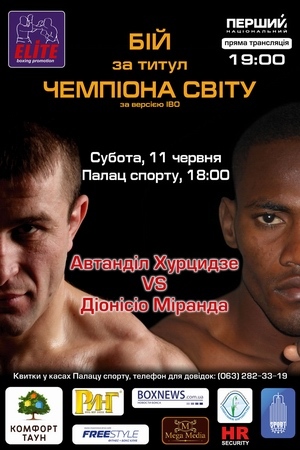 Kiev-based Elite Boxing Promotion will put forward another interesting show on June 11 at Sport Palace in Ukraine’s capital. In the main event of the show, IBO middleweight champion Avtandil «Tornado» Khurtsidze (24-2-2, 14 KOs) will conduct the first defense of his belt against hard-hitting Colombian Dionisio Miranda (21-6-2, 18 KOs). WBA #1 160lber acquired his belt with a unanimous decision over tough Pole Mariusz Cendrowski in March. This stocky slugger is best known for a hotly disputed loss to France-based Cameroonian Hassan N’Dam N’Jikam for the WBA interim belt in October. WBC #6 and IBF #11 Miranda is just 3-4 in his last seven fights, which hasn’t prevented him from getting some high international ranks despite crushing losses to Renan St. Juste, Roman Karmazin and Giovanni Lorenzo. The Colombian fighter is ranked thanks to his upset split calls over fringe contenders and former Arthur Abraham’s victims Sebastian Demers and Lajuan Simon in his ultimate bout. In another possible fight, lightweight Rustam Memetov (6-2, 1 KOs) will try to get a vacant national title against WBA #11 Valentyn Kuts (22-2, 8 KOs). The contest isn’t set yet. Cruiserweight prospect Dmytro Kucher (11-0, 9 KOs) and light welterweight Victor Postol (13-0, 8 KOs) are other participants of the show alongside several local talents.